Everyone will admire (and envy) the person who receives our Crystal Fan Award. This exquisite award comes in the shape of a rigid, hand-held fan. It has two opaque guards on either side of a clear crystal span which makes the perfect place for personalization. Our graphic artists can reproduce any emblem, insignia, or mascot that you provide them in this translucent space. 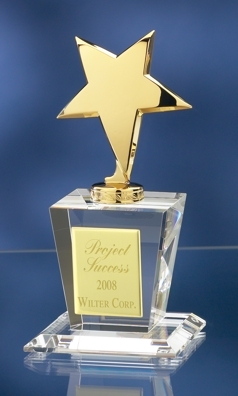 By using the latest in laser technology, our designers will duplicate your art plus engrave up to six lines of text on the award. All engraving is free! We also provide a free satin lined gift box with each award. If you order two of these awards, we will also provide free shipping too! Choose from two sizes we offer: item #CRY1438CM measures 8″ x 6″ while item #CRY1438CL dimensions are 9″ x 7″. Fan the flames of envy (and admiration) in your group by presenting some deserving recipient with our Crystal Fan Award.